I need elbow room!!! I don't want to be alone, but I can't stand a man hounding me all the time!! Still don't know the answer to this prob!!! @amadeo who can stand a man hounding them all the time??! I've always felt like a loner, but in reality I guess I've never been "alone". I think I have that balance of being able to enjoy alone time yet not actually be alone all the time. @much2say I like some alone time.I get this every day.Do have it. I do but not for more than a day or two. I am okay alone but your right, not always alone that would be sad. @BelleStarr yes very sad.There are so many out there alone. @amadeo Its true there are and I just we really should do more to make sure they have company. For short periods of time I don't mind it. But it's not often that I'm alone as we have two dogs. @amadeo A Beagle mix and a Terrier Mix. 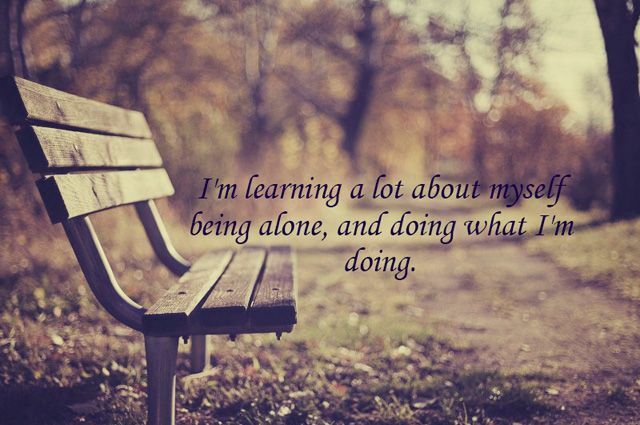 Sometimes I like to spend time alone. When I write my short stories I prefer to be alone, it is much easier to concentrate that way. On the other hand I don't want to spend too much time alone, and I am happy that I don't live alone. I enjoy spending time with my husband and we talk a lot when we are together. @porcospino good for you.Alone time for me sort of meditating. @amadeo It is good to spend some time alone, but I am also happy when my husband gets home. I miss living alone in my own place. Even when I'm inside the cabin soon, I'm still on my daughter's property and will be helping or in contact often. I like having friends but like having alone time when I want it. @noni1959 good for you.Alone time is very important and good for your mind. @amadeo I especially need it in the mornings when I wake up. Talking and hearing a lot of noise bothers me for at least an hour. I like being alone sometimes too, but like you I don't want to live alone. Same as you, I like being alone for a time, but not for a long time. @amadeo I do not like a lot to be home alone during the night. In a big house you feel in danger. @LadyDuck same here not night time. I would like being alone if i want to reflect and relax. @amadeo being alone sometimes is really a positive thing. :) Cause we need it. @Nickzter1331 every one need alone time.I do very much and have it every day when Mike is Out. Sometimes I want to be alone, but in short, but I would like to have a partner, whom I love, beside myself. @Nevena83 I see.Nice if you can find someone to share? @amadeo Yes, I am afraid of loneliness. @amadeo I like living with my cat so I do not feel I am alone. @amadeo Even if Sophie is not in the same room as I am I still know she is here somewhere in our home. When my husband had to travel for his business which was often I called it my vacation....I liked being alone for a few days. Now retired I don't have that vacation but we love each other and let the other do what they want to do. He golfs, I hike, we are not together all the time and when we are together we enjoy each other... I'm sure you and Mike must be like us....enjoy every minute.. I like to be alone for few moments but not always. Thats why got married. Lol. @debjani1good answer I loved it. a lot of times,yes.peace and quiet. When I need privacy being alone is the best idea.Yes I like it than to be surrounded with many but the people who are there are no good. I do not mind being alone for short terms, but the thought of being without my husband long term just brings tears to my eyes. @Juliaacv yes same here.Short term is fine.But we do need some time to be alone? I do like being alone for no longer than a week. I do fine with a week since I really can keep myself busy, but after a week, I need family or friends around. I love being alone and crave it.